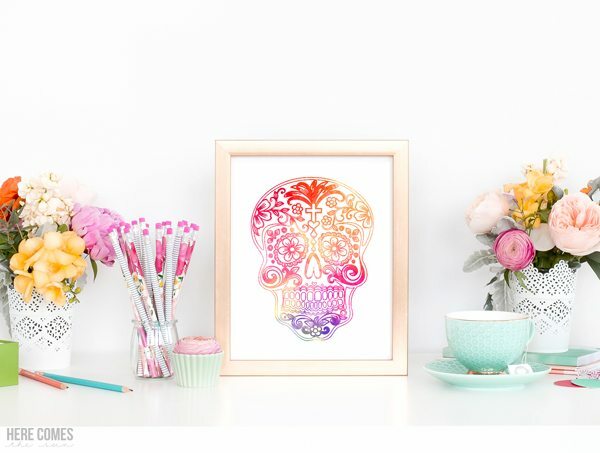 This Day of the Dead sugar skull print is so colorful and festive. I’ll be honest. I have seen sugar skulls for the past few years and had no idea what they represent. Buy O.M.G they are so beautiful. So I went digging for some info on these colorful creations. Sugar skulls are used during the Day of the Dead celebrations in Mexico. The Day of the Dead is a Mexican holiday celebrated on November 1 and 2 where deceased loved ones are honored. On the night of October 31, it is believed that the gates of heaven open and the spirits of deceased children come down to reunite with their families for 24 hours. On November 2, the spirits of deceased adults join them. Altars honoring loved ones are decorated with flowers, candles, food, toys, candies and sugar skulls. Sugar skulls represent a departed soul and the name of the departed is written on the sugar skull forehead to honor their return. On November 2, the celebrations are taken to the cemeteries. This whole celebration just fascinates me. I love the way that the deceased are honored with a joyous celebration. 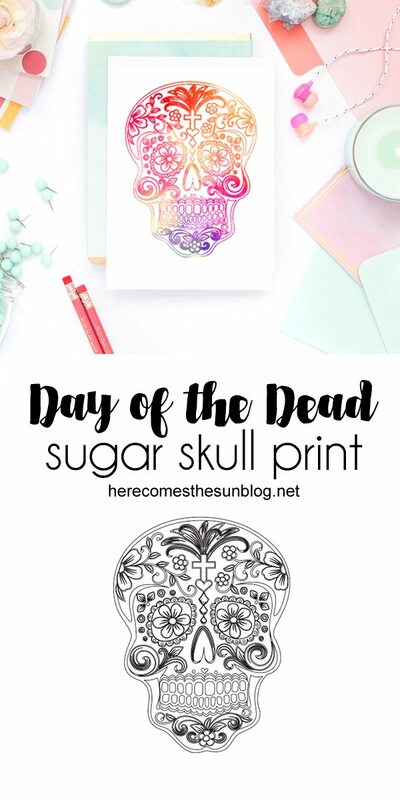 Today, I’ve created a Day of the Dead sugar skull print for you. I’ve made two versions of this sugar skull print so you can either color it yourself or print out the version that is already colored. And since I love watercolor, I just has to add that touch. My kids had a great time coloring in their sugar skulls yesterday. My daughter even added glitter to hers to make it extra fancy. This would be a great way to teach your children about different customs. These prints are for personal use only. You may not sell them or incorporate them into your designs. Like this print? Be sure to check out the rest of my watercolor prints.